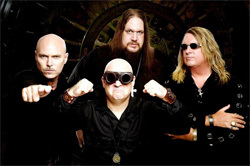 Mindcage is the project of Dietrick Hardwick (guitar), Brian Howell (bass) and Craig Nudo (drums) connected by 30 years of friendship and music. With the addition of vocalist Jeff Hignite, the band has reached the culmination of a long journey, their first full-length release Our Own Devices. Our Own Devices is a steampunk fantasy tale put to spirited progressive power metal. It concerns a dystopian world of clockwork, passionless, efficiency devoid of the "virtues of arts, music, and spirituality." It's in desperate need of a hero to release the world from it's burden. That hero is The One Constant, Arabella Vash, who hopes to awaken society from their perpetual slumber and save the human race. Naturally, if you got a concept and a tale to tell, much of that telling will rely on the lyrics. Thankfully, Mindcage includes them all in the, rather difficult to read, CD booklet. The lyrics have that appropriate mixture clarity and vagueness that keeps the story somewhere between intriguing and mysterious. But Jeff Hignite makes the words come alive as he is a powerful and versatile vocalist with great range. At times he reminds me of Geoff Tate. On two songs, The Human Race and The Serenity Sequence, Arabella is given a voice by (I think) Hydrogyn's Julie Westlake. This in turn this makes me describe the sound of Mindcage as a cross between Dream Theater and Queensryche. MIndcage's progressive metal isn't overly technical, but tempos and signatures can bend and turn throughout. Most everything moves upon the vocal arrangements expressing they lyrical concept and Dietrick Hardwick's blistering guitar work. Some songs have a hastened pace like For All Mankind. Another, Our Own Devices moves more steady building musical momentum in careful steps. Firefly is bold and thundering with clashing and smashing drum and constant bass powering the arrangement until Hardwick rips it up once more. The aforementioned The Serenity Sequence is the softest piece with the duet vocals lilting over lighter guitar. Our Own Devices is quite impressive: between the idea, lyrics, vocal arrangements, brisk guitar, and accomplished arrangements, it easily stands in the fine tradition of conceptual progressive metal albums like Queensryche's Operation Mindcrime. Very recommended. 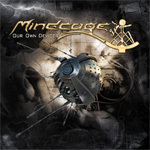 Our Own Devices is quite impressive: between the idea, lyrics, vocal arrangements, brisk guitar, and accomplished arrangements, it easily stands in the fine tradition of conceptual progressive metal albums like Queensryche's Operation Mindcrime.